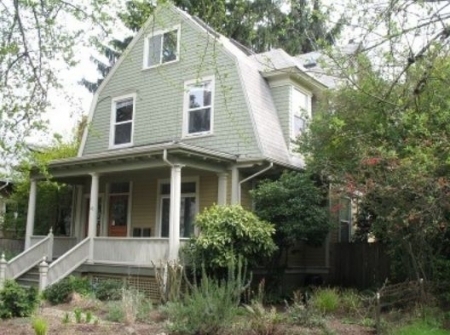 This gorgeous 1904 Dutch Colonial home is located in the prominent, quiet, Historic Irvington district. This is by far the nicest centrally positioned neighborhood in downtown Portland. It is known for its beautiful historic homes, friendly people, luscious trees, but most of all for its fabulous, strategic location. This home is close to the whole thing so the car is not a necessity. MAX (light rail) system (free to the center) is 10 minutes away as well as numerous bus lines in close vicinity. Oregon Convention Center, Rose Garden Arena, Lloyd center shopping mall and many breathtaking restaurants and shops are within walking distance. Our Walkscore is 86. Downtown/Pearl District is a few minute drive or 9 minutes on the MAX. The hip Mississippi and charming Belmont neighborhoods are also minutes away. This charming home is a duplex and the top floor of the house is occupied by your hosts, Tijana (Teeyanna) and Milos (Meelosh) and their daughter Nita, who live in a finally separate apartment. Additionally, if you still have time to explore our beautiful Pacific Northwest, outside of the Portland metro area, Mt. Hood or the beach are only an hour away, wine regions 45 minutes. The entire 1,000 sf main level, with the separate entrance, has been recently updated and offers a spacious and stylish living room, fashionable bedroom, cozy dining room, charming kitchen with the original wood cabinets, luxurious bathroom and a fabulous, private back yard with the koi pond and a calming water fountain that offers utter recreation in the center of the city. The bedroom is outfitted with quality furniture, tranquil queen sized bed and luxurious bedding. The bathroom is stocked with shampoo, shower gels and other amenities. The gourmet kitchen is fully equipped for all your cooking and baking needs. There is also a BBQ in the backyard. If additional, area of expertise items are needed just ask in advance. Pre-stocking the refrigerator before your arrival is also available. Complete washer/dryer, dishwasher, disposal, coffee maker and microwave are included. Complimentary coffee and tea. For your convenience we provide wi fi, flat screen HDTV with cable, DVD player and CD player/stereo system. A comfortable pull out sofa bed (with an air mattress) in the living room is provided to provide somewhere to stay additional guests.